Russell Wilson. Connor Cook. And that's it. Those are the only non-Buckeyes to claim the B1G's highest honor for quarterbacks since 2011, the year when the conference debuted all of its hyphenated awards. Dwayne Haskins winning in 2018 as a first-year starter gave Ohio State its second three-peat in the Griese-Brees pantheon. Wilson survived Joe Bauserman's candidacy and Cook, well, that was Ohio State's fault. As fans of this team, we participate in a culture that remembers all of the bad things (Iowa! Purdue!) far more readily than the blessings (almost literally every other game!) which means we get to ask important questions, like is it reasonable to expect the best QB in the conference every year and why aren't the Buckeyes on an eight-year Griese-Brees winning streak? Russell Wilson Braxton Miller/Joe Bauserman Self-nuke Tatgate season; Miller still beat Wilson H2H. True freshman Braxton Miller coached himself in 2011 and still beat Wilson head-to-head. Quarterback play at Ohio State has been embarrassingly consistent and good for nearly two decades now. The rare bad spots are bound to stick out, just like wins and losses. Iowa. Purdue. Even the bad hasn't been bad; the 2010 edition of Terrelle Pryor did not make either 1st or 2nd team All-Conference. Immortals Dan Persa (Northwestern) and Scott Tolzien (Wisconsin) took those honors over the two-time Preseason, Rose Bowl and eventual Sugar Bowl MVP. Ohio State has been recruiting the best quarterback talent in the conference for a generation. When it doesn't touch the sky, look at the position coach first. Nebraska MAtched Ohio STate for All-B1G Receivers During Urban Meyer's Tenure. Nebraska. Outside of the 112th pick of the 2004 MLB draft who was unexpectedly thrust into Pryor's role, every starter - as well as backups like Kenny Guiton, Cardale Jones and Dwayne Haskins - have turned in a magnum opus performance in relief. We are experiencing the most dominating decade of QB coaching in Ohio State history, which has been the annual lovechild of superior recruiting and teaching. So you would figure Ohio State wide receivers have been adulated in parallel to the guys who have been breaking passing records regularly. Time to ask those fan questions again - is it reasonable to expect the top-tier wide receivers in the conference every year and why hasn't any Buckeye won the Richter-Howard award yet? Aaron Burbridge* (MSU), Alex Ericson (UW), Jehu Chesson (UM), Jordan Westerkamp (NE), Chris Godwin (PSU), Michael Thomas, Caroo Thomas, Marshall, Brown, Miller, Dixon, C.Smith, James Clark, Ben Victor, Terry McLauren, K.J. Hill, Parris Campbell Coaching malpractice. 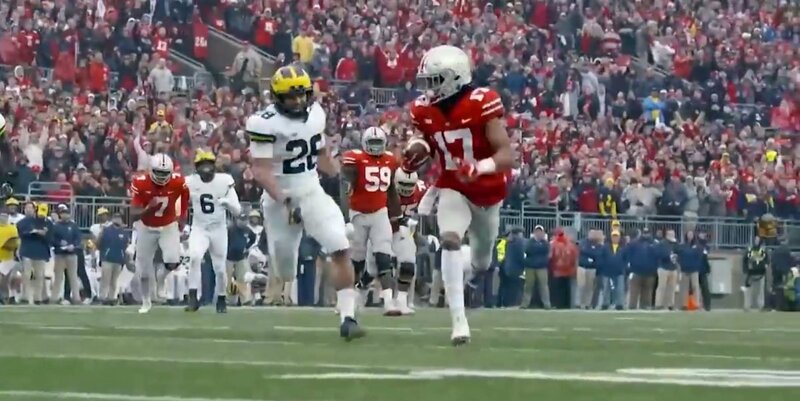 Austin Carr* (NU), Curtis Samuel, Amara Darboh (UM), R.J. Shelton (MSU, DeAngelo Yancey (PU), Westerkamp, Drew Walitarsky (MN), Godwin Brown, Clark, C.Smith,Victor, McLauren, Hill, Campbell Samuel, 1st team WR as an H-Back who also had 97 carries. Rondale Moore *(PU), Campbell, Tyler Johnson (MN), Morgan, Spielman, K.J. Hill, Donovan Peoples-Jones (UM) Mack, Victor, Dixon, Campbell, Hill, McLauren, Saunders, Chris Olave Breakthrough season. Two honorees from a reliable, thriving unit. TL;DR it's the coaching, again. And no, it's not unreasonable to expect Ohio State to regularly produce a single wide receiver who gets a plaque now and then. Six QB of the Year awards. Every single school passing record broken; some more than once, others more than twice. It's not as if Zone Six was competing against a bunch of Michael Thomases (3rd team all-B1G, once) for recognition. Nebraska ended up with as many All-B1G wide receivers as Ohio State had during Urban Meyer's tenure. Every one of the top six seasons by a QB in Ohio State history is represented in the first table above, and Zone Sicks was still an afterthought when it came to awarding the best receivers in the country who didn't also split time as running backs. Then the 2018 season happened, and Haskins now has six of the top seven school records for passing yards in a single game. Something else happened last season. Receivers who previously had feet for hands suddenly became reliable pass-catchers, even in 50/50 situations. Guys who never got open suddenly got open all the time. It was almost as if they were being instructed by a more effective teacher! Chris Olave introduced himself to Michigan's defense and special teams in 2018. Barrett - whose arm strength and accuracy were maligned throughout his college career - passed for more yards than Art Schlichter did in each of his three seasons where he held the starting job - and had one true WR get a 3rd team nod. Ohio State's guys were the most unreliable and underperforming unit of the nine for every season under Meyer (up until the 2018 defense said hold our beer). In a twist of irony, Brian Hartline caught passes at Ohio State from a QB who played without the benefit of a real position coach. Pryor was always more legs than arms as a result, and by the time Hartline retired from the NFL to explore coaching he found his former unit under the tutelage of a classic failson, impervious to being fired, poached by another program or promoted internally. Hartline's door swung wide open last summer when what should have happened years earlier finally happened. He inherited a room full of great locker room-type guys who just needed competent mentoring and instruction. His second unit in 2019 unit will be a terrific mix of young and tenured, but will have a new starting quarterback throwing in its direction for the second year in a row. Zone Sicks would have been in trouble in a spot like this. It always was. But this feels like an overwhelming position of strength now, after so many seasons of being underwhelming. They've never been short on athletic freaks or high-potential guys; just results and consistency. That disappointment streak came to an abrupt halt in 2018 and Zone Six should continue to shine as Ohio State embarks on a B1G title threepeat.